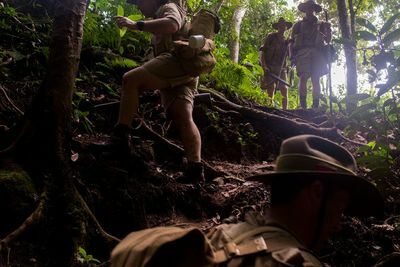 On the 25th of July 1942 seventy six years ago, A Company of the 39th Australian Infantry Battalion started their arduous trek across the Kokoda Track to join their mates from B Company, already in position on the northern side of the Owen Stanley Ranges having secured the Kokoda area in readiness for an expected Japanese attack. Join us on a true reenactment of this Advance to Kokoda as we dress, eat and live exactly how A Company did on their journey over the Owen Stanley Ranges. 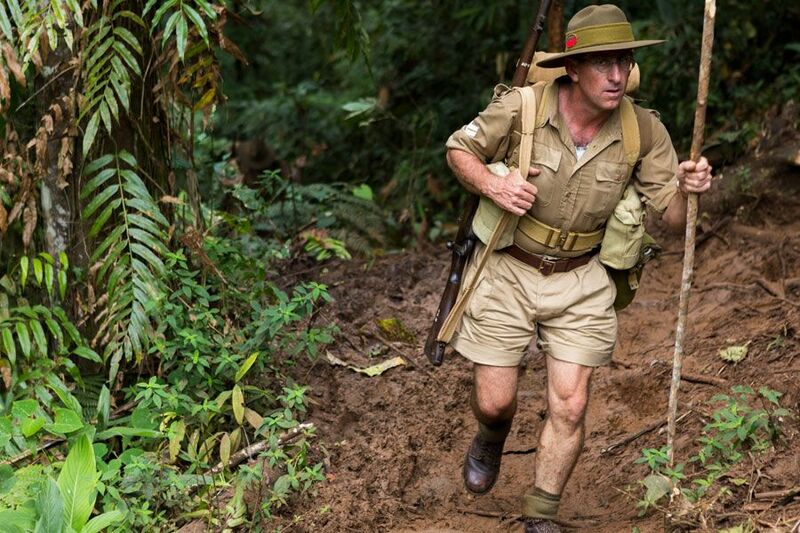 We will kit you out in replica uniforms (including boots) and give you the same rations they had as we immerse you in the real history of this trek. 2019 Update: future expeditions are currently on hold - if you are interested in this trek please contact us at No Roads. 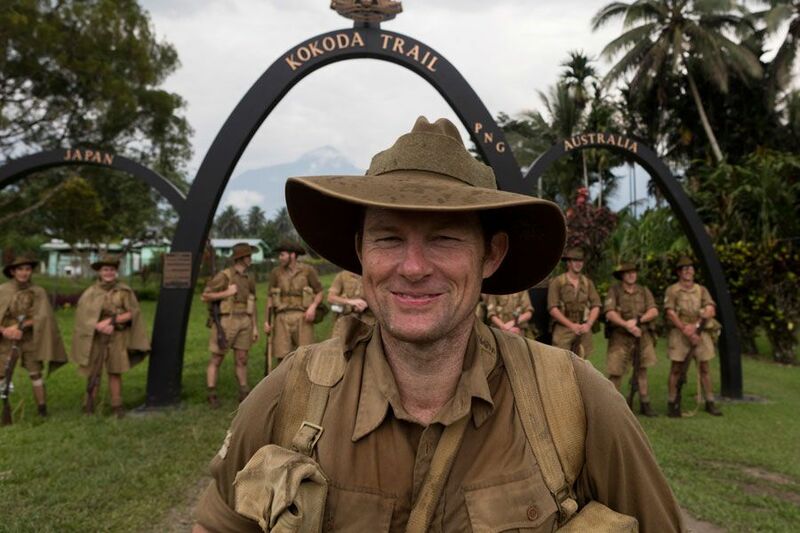 As we follow in the footsteps 76 years later, the story of the Kokoda Campaign will be brought together by Shane Chisholm and Justin Kibell who were part of the original reenactment of B Company March to Kokoda in July 2017. These stories combined with you the participant wearing the same clothing and equipment as the 39th did, will certainly add a new dimension to trekking Kokoda. As you make your way over the Track you will open reproduction letters (taken from the originals) sent from the troops and received by the troops. 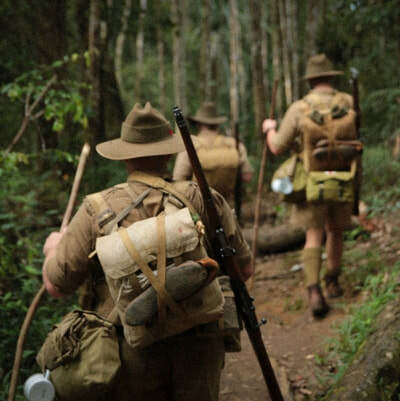 You will wear ‘dog tags’ and carry with you a replica pay book in the name of one of the soldiers who made the journey 76 years ago. Both items will are yours to keep and will enable you to have a greater understanding of what our troops went through. The reproduction uniforms and equipment have been sourced from specialist manufactures and are exact reproductions of the originals. They will come in your size and be sent to you prior to the trip. This will include your pack, water bottle, sleeping equipment, boots etc. All you need to bring with you is a bucket load of Aussie spirit as we undertake the ultimate pilgrimage to remember those who fought and those who paid the ultimate sacrifice for our nation in 1942. You will also participate in a special Memorial Service to be held at Brigade Hill, Isurava and Kokoda. ​Note: This Itinerary is indicative and may change due to local conditions. 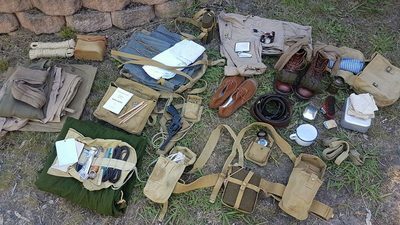 ​You will be provided with a combination of replica and real items from 1942 including the slouch hat, cotton shirt, pattern 37 pouches and webbing, shorts, woolen sock, gaiters and leather boots. We will send you the leather boots months ahead so you can wear them in. 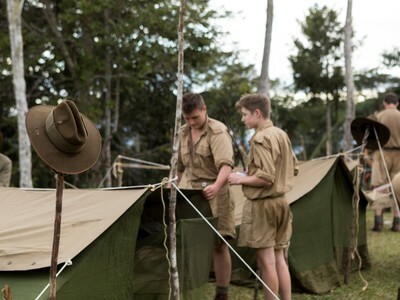 You will also be given wet weather gear and accommodation - your rain cape, ground sheet and mosquito net. A detailed document will be supplied on your booking. Issued equipment will need to be returned except your boots, ID tags and paybook. Selected items will be available for purchase post expedition. Please read the following information which explains what is included, any exclusions, booking and expedition conditions and upgrades available for this expedition. Click on the following web-links to find out more about the topics described below. 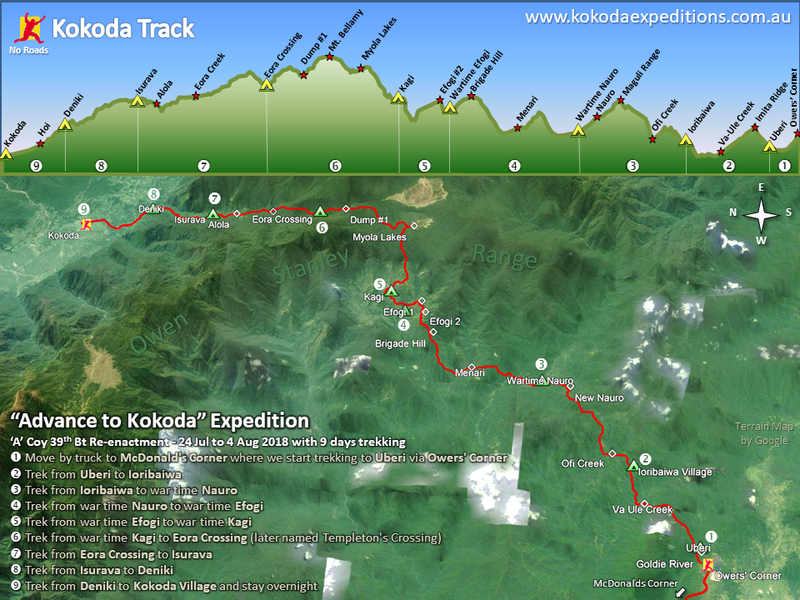 How we Operate - why should you trek with No Roads? 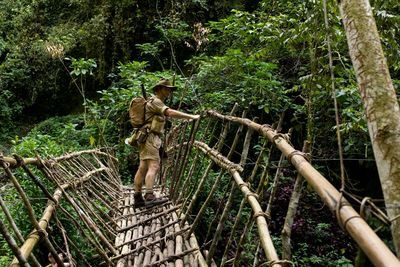 Learn more about how we manage safety and security, our philosophy, our team of Porters and Guides, what others say and we will bust some myths about the Kokoda trekking scene. 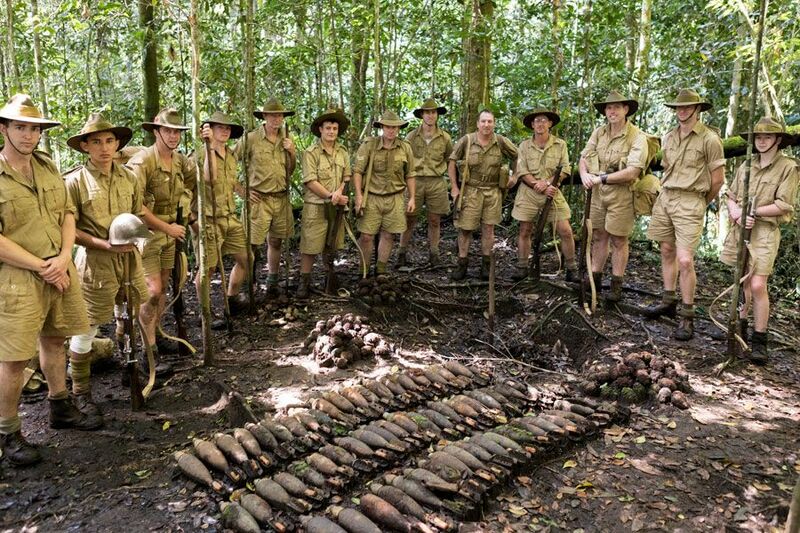 Kokoda Expeditions - learn about the Kokoda Track itself, the people and terrain, the plants and animals, more about our expedition team and the different types of Kokoda adventures we offer. Preparation - to properly prepare for this expedition we have provided detailed information on how to plan for your expedition, prepare yourself both physically but also advice on health and medical considerations, and lastly what gear to bring (and to leave home). Meals - No Roads offers the highest standard of delicious and nutritious meals along the Track and special dietary considerations can be catered for if we are notified in advance. 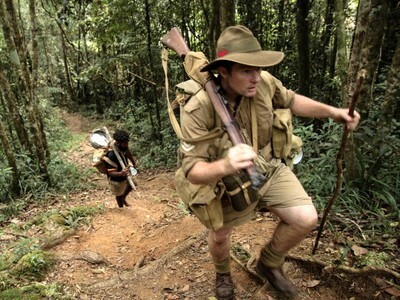 Military History - The history of the Kokoda Track during 1942 is nothing short of amazing. The stories of individual efforts, of triumph and defeat are ones that are still helping to shape Australia’s identity. Read our campaign overview and detailed key history events notes. 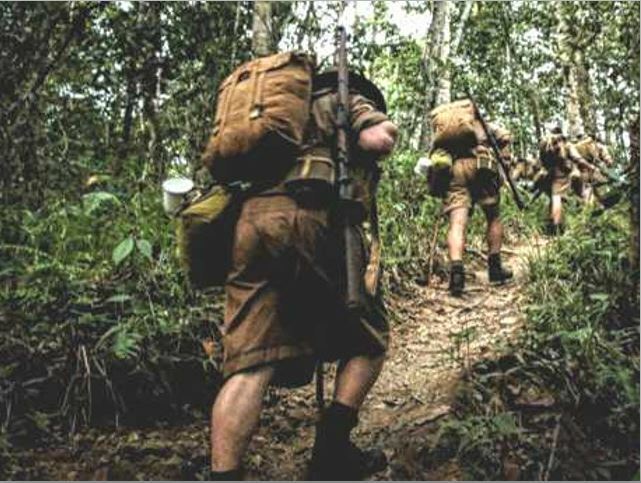 On Expedition - To complete your preparation we encourage you to read about the three stages of the expedition grouped into before trekking, trekking and after trekking. The information in these pages will assist you greatly in preparing and understanding what to expect on expedition. All meals on expedition which will include tinned fruit, dried potatoes, sausages, vegetables, jam, butter and beans. Dehydrated mutton was also a standard ration and was considered one of the finest foods of the campaign. 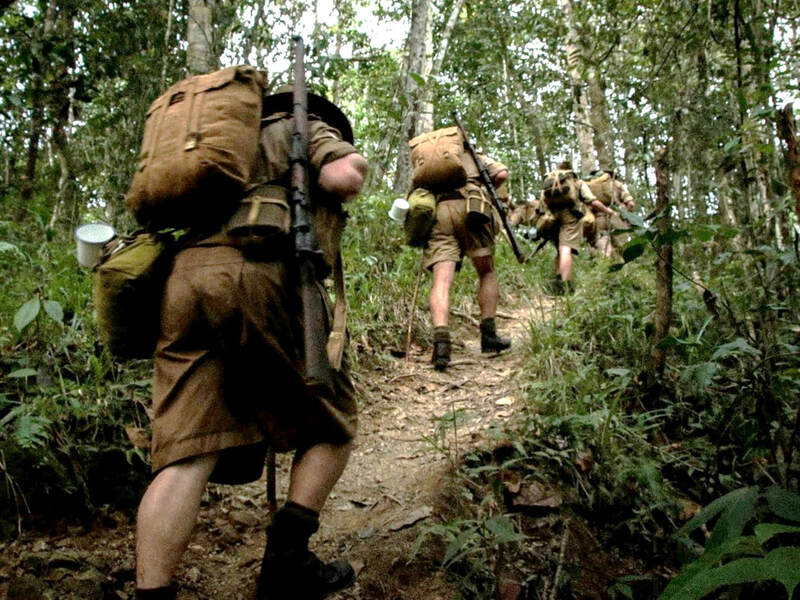 Use of period uniform, boots, back pack, equipment etc.. Some items will be sent to you prior to the trek. Boots, ID tags and pay book are yours to keep but everything else must be returned to No Roads Expeditions. Selected items used may be available for purchase after the trek. Nutritious and delicious food for Porter team who deserve the best. 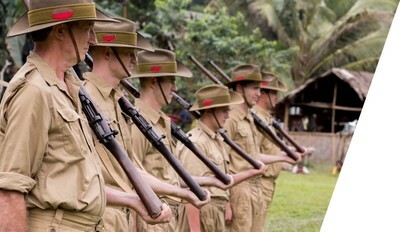 Hand selected porter team - dressed in period uniforms for the carriers. Access to the pre-trek preparation information provided in this website. A small number of reenactment items will need to be purchased like a period toothbrush and toothpaste. Information will be provided about these types of items. Travel insurance that includes medical evacuation is considered mandatory. 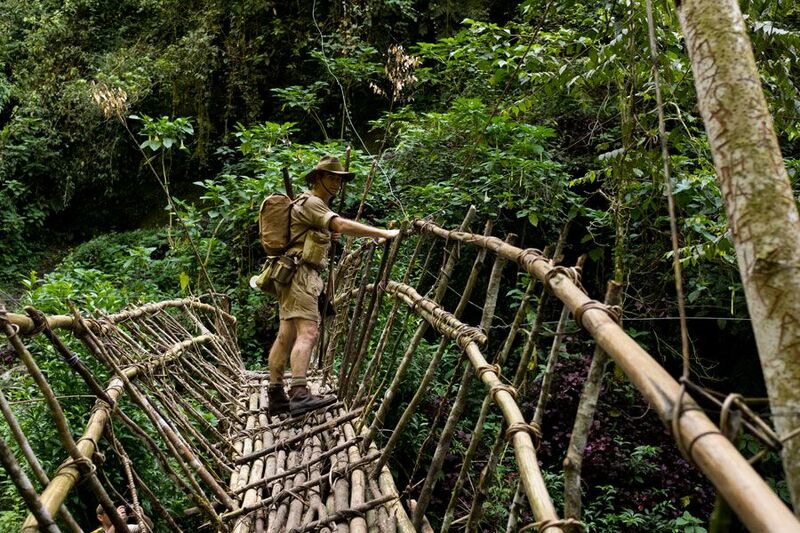 This 11 day expedition is a demanding walk that requires an above-average level of fitness. Some days are long hauls of 7 to 10 hours through humid, possibly wet and hot terrain. Physical fitness preparation is necessary. 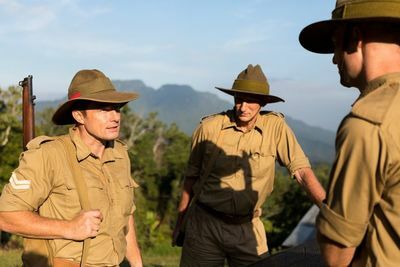 This expedition is a living history expedition so we wear the uniform, packs and gear, and eat the food that the soldiers did. This clothing and equipment is basic when compared to modern equipment and uncomfortable. Expect an added level of difficulty to this expedition. You will be dirty, tired and a little hungry. Minimum numbers for the scheduled expeditions are required, typically 8 to 10 people. Please contact our office regarding our scheduled departures to discuss your needs. We aim for a lower impact and safer expedition by limiting our group size to less than 18 trekking customers per expedition. Typically our expeditions are around than 10 to 15 people group size (not including the porter team members). The following upgrade options can be selected when you make a booking online. For those that do not wish to share accommodation in Port Moresby, a Single Supplement of $380 will apply. ​After expedition activities - please ask our Expedition Consultants about options such as helicopter flights, Loloata Island resort, Port Moresby Nature Park and more. If you cancel your booking more than 90 days prior to departure your deposit will be refunded less $200 administration booking fee. If you cancel your booking between 45 and 90 days prior to the commencement of your Expedition you will forfeit your deposit. If you cancel between 45 days and 28 days before the departure date you will lose 50% of the Expedition cost. If you cancel up to 28 days prior to the departure date you will lose 100% of the Expedition cost. If after cancellation we fill your place on the Expedition and the Expedition is fully booked we will at our discretion refund your money less an amount to cover No Roads Expeditions (NRE) administration costs. We may, at our discretion choose to offer you another Expedition. Full payment is due 45 days prior to departure date, if you fail to pay by this date you can lose your place on your chosen expedition and your deposit will be forfeited. In the event of NRE being forced to cancel an expedition for reasons of security or personal safety (e.g. 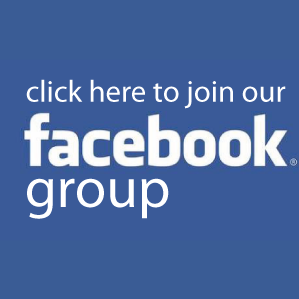 civil unrest, seismic activity ,etc. ), the amount paid would be transferable to another Expedition or would be refunded, minus a reasonable amount for administration costs and cancellation fees charged by airline and accommodation companies not controlled by NRE. Administration fees would be calculated on a case by case basis. While acknowledging the travel warnings posted by respective Foreign Office departments NRE do not accept cancellation due to these warnings in isolation, we take into consideration information from numerous sources including reports from our local offices in the respective country and act accordingly. In the event of NRE cancelling an expedition we would work with all affected members to try to provide an alternative venue or the expedition fee will be refunded minus associated costs out of NRE's control. The following liability release statements are found on our booking form and provided here for reference. You will be asked to sign a copy of this release in Port Moresby before trekking. I have been advised by 'No Roads Expeditions' (NRE) of the following matters in relation to my upcoming expedition with NRE. I have been advised that, snorkeling/swimming, trekking, climbing and especially mountaineering are inherently dangerous activities. I may be killed, injured, incapacitated and experience pain, illness and suffering. 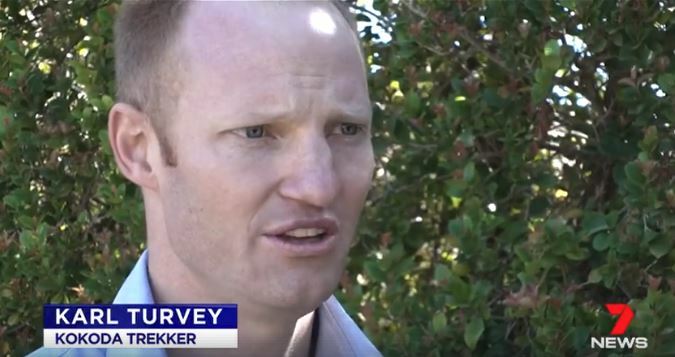 I may experience loss, damage or theft of my property. Any of the above may not be NRE's fault or the fault of anyone else. These incidents may be caused by others in my party, employees or directors of NRE, their subcontractors, my guide or wildlife, environmental factors such as ice cliff collapse, avalanche, bad weather, loose rocks, unstable snow or even just physical exhaustion which can happen at any time on my Expedition. There is no way of predicting all the hazards I may face. While NRE will take reasonable precautions to minimise the risks, there is no way NRE can guarantee my safety on this expedition 100%. Often areas of operation are remote with little or no medical support. In some remote areas self-rescue is the only option. 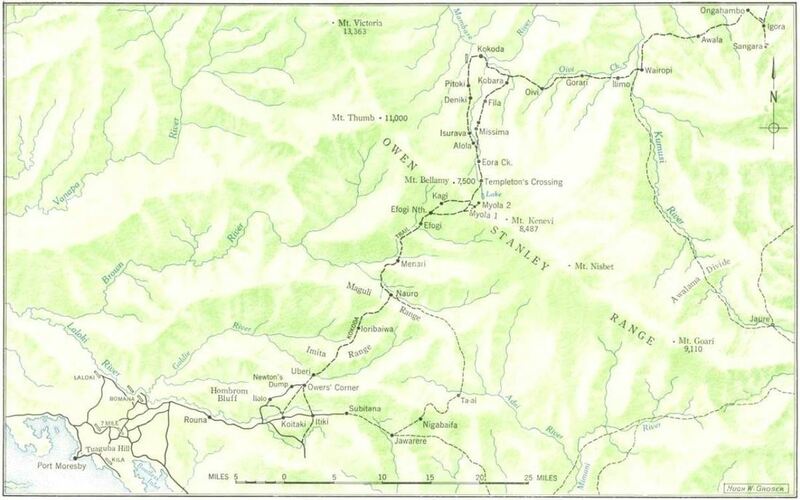 My guide may need to begin first aid appropriate to the remoteness of the area and the nature of my ailment. While NRE will take all reasonable precautions to maintain my safety I understand that I also am responsible to act in a responsible and safe manner that will not endanger myself or others in my party. By signing or ticking this document I certify that I have read and understood these risks and they are acceptable to me. I also agree not to seek compensation, financial or otherwise from any incident that might occur during or associated with your trip, from NRE, it's directors, employees or subcontractors. I understand NRE will not accept my participation on expedition if I do not have suitable or sufficient travel insurance to cover such events as illness, remote area evacuation, etc. NRE is not responsible for any medical, hospital, doctor, rescue, evacuation, or associated transportation costs. We will where possible assist you with any emergency logistics in the event of problems.